In a memo dated August 12, 1992, Sheridan noted, "Our objective in retaining Jim Murphy and his firm, Bishop Services [subsequently renamed Sutton Associates], is to uncover all evidence, credible or otherwise, tending to implicate or absolve any member of the Skakel family in the assault which resulted in the death of Martha Moxley on the night of October 30, 1975." Sheridan's decision was made as a result of new information regarding the investigation and a request for access to Skakel family members received from Jack Soloman [Solomon] and the Greenwich police department. Access had been limited for quite some time. In early 1976, Skakel attorney Manny Margolis contacted the chief State's Attorney for Fairfield County, and the captain in charge of detectives of the Greenwich Police Department, to insist that all further and future police contact with the Skakel family be limited to contact directly through his office. Apparently, Soloman [Solomon] claimed his interest in gaining access to Skakel family members was for the purpose of further implicating Ken Littleton as the offender. Soloman [Solomon] expressed this motive to Manny Margolis as well. "What do I have to do to convince you that Littleton is our man?" Sheridan reports Soloman [Solomon] as saying at the time. Believing that if Littleton was indicted his defense lawyer would certainly "be dragging in" members of the Skakel family into the case, Sheridan was motivated to prepare for such a potentiality. 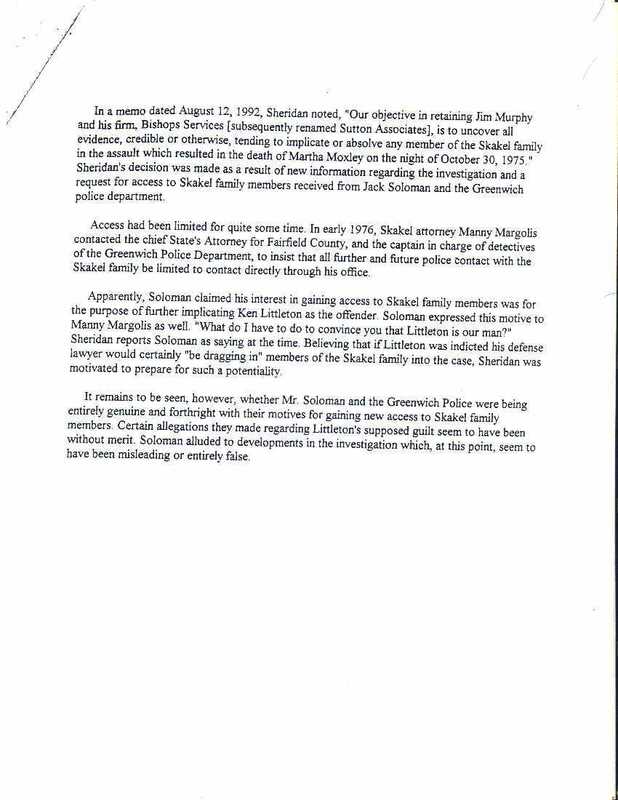 It remains to be seen, however, whether Mr. Soloman [Solomon] and the Greenwich Police were being entirely genuine and forthright with their motives for gaining new access to Skakel family members. Certain allegations they made regarding Littleton's supposed guilt seem to have been without merit. Soloman [Solomon] alluded to developments in the investigation which, at this point, seem to have been misleading or entirely false.